A seminar on Financial Exclusion, Poverty and Destitution was organised by InM on May 17, 2015. 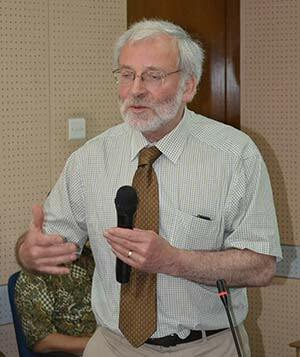 Two papers were presented in the seminar by Professor Glen Bramley, Professor of Urban Studies, Institute for Social Policy, Housing, Environment and Real Estate, Heriot-Watt University, Edinburgh, UK and Toriqul Bashar, Institute for Social Policy, Housing, Environment and Real Estate, Heriot Watt University (PhD Student), Edinburgh, UK. Professor. Baqui Khalily presided the seminar and Dr. Qazi Kholikuzzaman Ahmad was present as a guest of honor. The presentation will start by considering the current status of these concepts in academic and policy debate. It will briefly describe a recent major national survey of Poverty and Social Exclusion in UK and highlight some key definitional and measurement issues. Key findings will be described, highlighting generally adverse changes over time in many indicators and the strong relationships between poverty, debt and financial exclusion, albeit also noting the growth of financial problems among the non-poor. More detailed features of financial exclusion and how people cope with these problems, with what types of support, are examined. The presentation will draw on even newer evidence about severe poverty and destitution in the UK, highlighting issues of social consensus re minimum necessities and what sources of support different groups rely on. The seminar will conclude by reflecting on how UK compares on these issues with other countries in Europe and the wider world, and on some connections between developing countries such as Bangladesh and the UK. The prevalence of urban poverty is a distinctive feature of cities across the globe. In addition to the established trend of urbanisation accompanying economic development, the dangers of climate change would lead to an additional threat to the poor population moving to the cities in the next few decades. This influx of landless poor into cities has been accompanied by the lack of basic urban service. The situation threatens progress with the multidimensional poverty measures which perceive development as a sustained improvement of basic human needs. This presentation will examine the socio-economic vulnerability of the urban poor in Bangladesh associated with the housing problem which is retarding sustainable economic progress, followed by an investigation into social capital. New empirical data from a special survey will be reported and that the analysis will test certain expected relationships from theoretical literature on social capital. Additionally, the roles of microfinance institutions as a specific form of intermediation will be examined in the process of mobilising social capital. This might add value to urban poverty studies as well offering an implication for national and international development interventions.